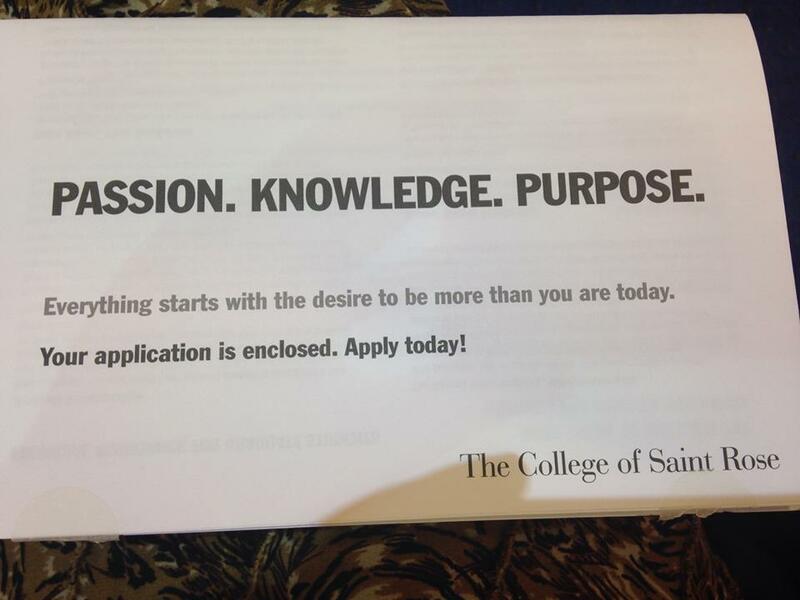 Apply Yourself – Apply to Saint Rose’s Graduate Program! Well, it’s that time of year again! 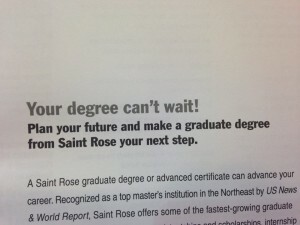 Time for seniors at colleges like The College of Saint Rose and beyond to sit down and start thinking about the future. Scary, right? If your immediate future is similar to mine, then you’re probably going to try to go to a Graduate School to receive a Masters Degree in something either in your field, that coincides with your field, or something completely different. I fall into the middle category; I am going to receive a Bachelors of Science in Music Education, and want to pursue a Master’s Degree in Curriculum and Instruction. This would allow me to further my education in Music Education, but from a new perspective. So. How do you apply to Grad School? What are the steps you should be taking to be successful in applying and being accepted? Well, look no further, because I am here to help you how to Apply Yourself and Apply to Grad School (more specifically, Apply to The College of Saint Rose). 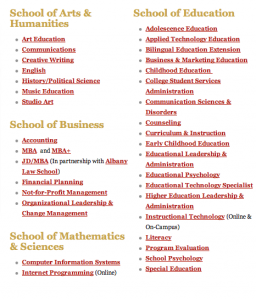 Pick Your Degree: When first looking at the many Graduate Programs offered at The College of Saint Rose, it’s easy to get overwhelmed. 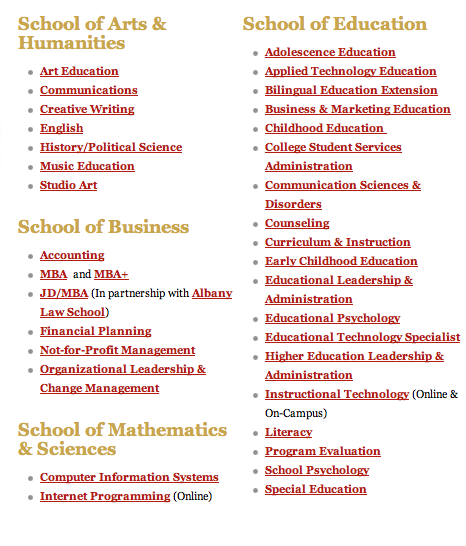 After all, we do offer 52 graduate degree programs! That’s quite a lot to choose from! So, take a gander, see which degrees appeal to you the most, and find out what requirements you need to fulfill in order to be accepted into the program. The Graduate Degrees offered at The College of Saint Rose! Attend an Open House! : If you’re still unsure of what degree you’d like to choose, or want more information about a degree or about the college, then attending an Open House is a must! The members of the Graduate Admissions team is absolutely amazing; they are so welcoming, informative, and will stop at nothing to make sure you understand everything you need to know about applying. They are very dedicated to what they do and want nothing more than to see you succeed at getting the opportunity to attend Saint Rose! Not only are members of Graduate Admissions there, but faculty members from the various departments and degrees offered are there to speak to you personally about your application process and to answer any questions you may have about the program. Another calming presence at the Open Houses is a member of the Financial Aid Department, there to give applicants a presentation about financing their education, and answer any questions they may have about scholarships and graduate assistantships. A collage of the Graduate Open House I attended! 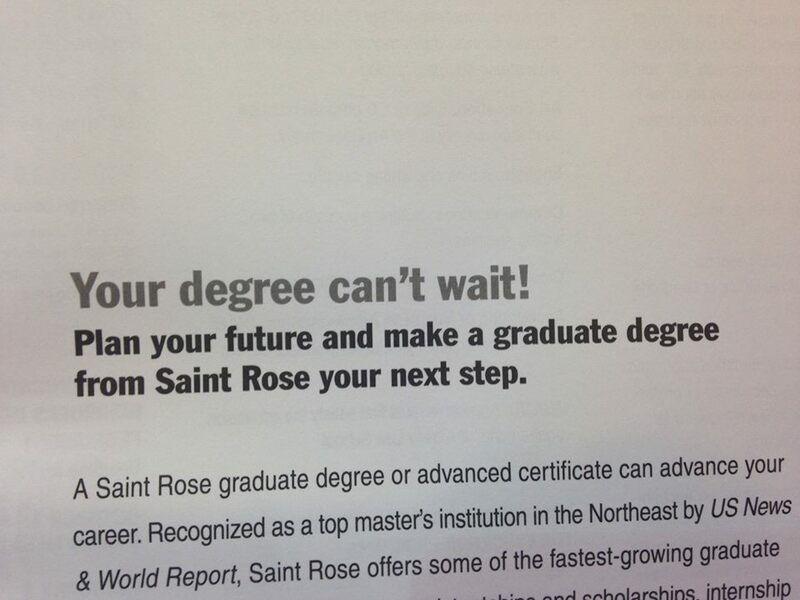 Applying to Saint Rose for a Graduate Degree is probably one of the best choices I’ll be making for my future. Hands Down. 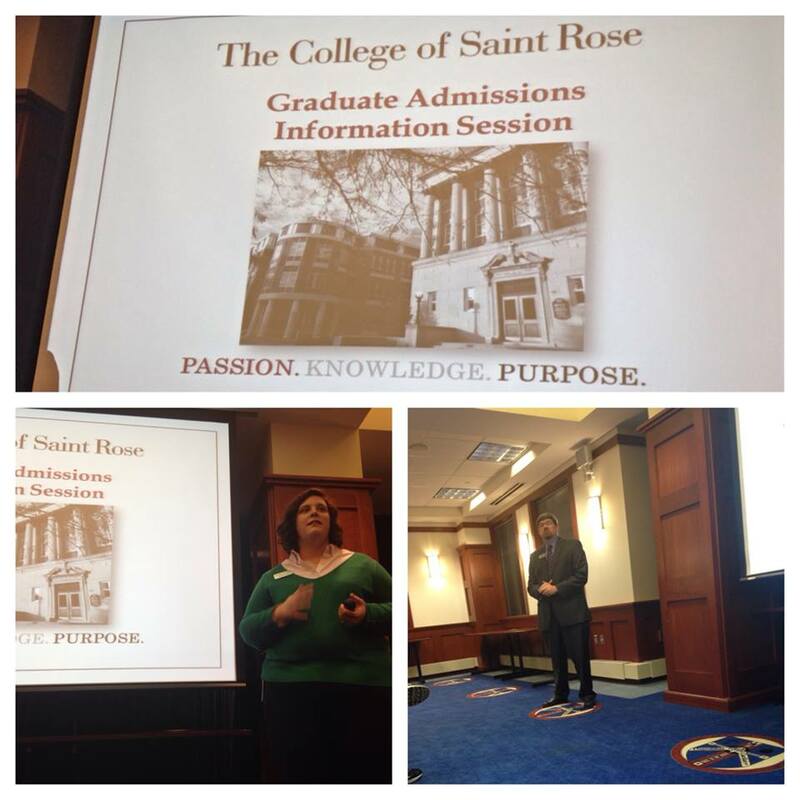 Create an Account with the Saint Rose Application System: Once you’ve decided on a major, then head on over to this website and create an account for a Graduate Degree Application! 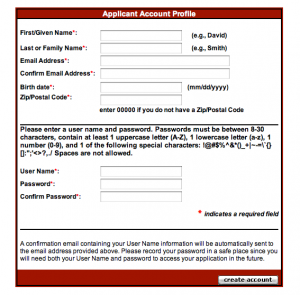 It only requires your basic personal information, and it takes about 2 minutes! Once created, you have access to the graduate degree application, and can add and edit anything you please! 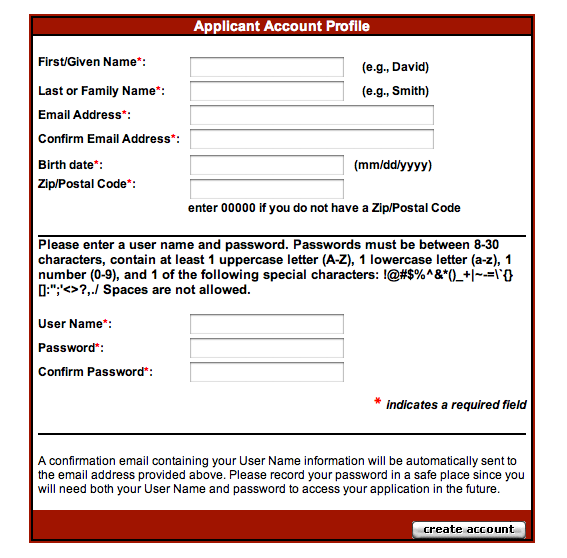 A look at the set-up for creating an account with the College of Saint Rose’s Graduate Degree Application! **MAKE SURE TO GET 2 LETTERS OF RECOMMENDATION! ** Be pro-active and ask people you want to write a positive letter of recommendation as soon as possible! These take time to write and to send in, so it’s best to ask as early as possible! And Wait. According to Graduate Admissions, it could take about 2-3 weeks to process your application. In my case, it’ll take longer to be accepted or denied (PLEASE ACCEPTED), just because I am not a fully certified teacher yet. Once I have passed 2 certification tests, I can send in that information, and I will be notified if I am accepted into the program! Yay! 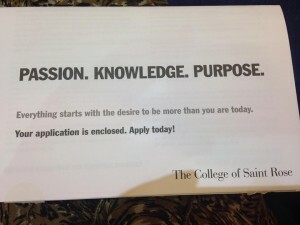 So: Are you ready to apply to The College of Saint Rose for Graduate School? Hopefully this little list helped you on your journey to higher education! If you have any more questions about the process, please do not hesitate to contact an admissions counselor from The Office of Graduate Admissions! Your Degree Can’t Wait! Apply Today!